With more than two million objects, the Collections Research Center (CRC) at Mystic Seaport houses one of the premier maritime collections in the United States. In person or on the web, we make our collections available to all researchers. Although no appointment is necessary, we strongly suggest making sure that the materials you are interested in are available for viewing prior to your visit. Please bear in mind that some collections are restricted for research. Stay on the left/west side of the street, and walk north on Route 27 toward the CRC. Continue to the Latitude 41° Restaurant, and cross the street using the crosswalk at the North (Additional) Parking Lot. Walk north on the sidewalk along Route 27; the CRC is the brick building ahead of you. Walk through the archways. On your right you will see the door. Once inside the second door, turn right into the Collections Access Research Room. 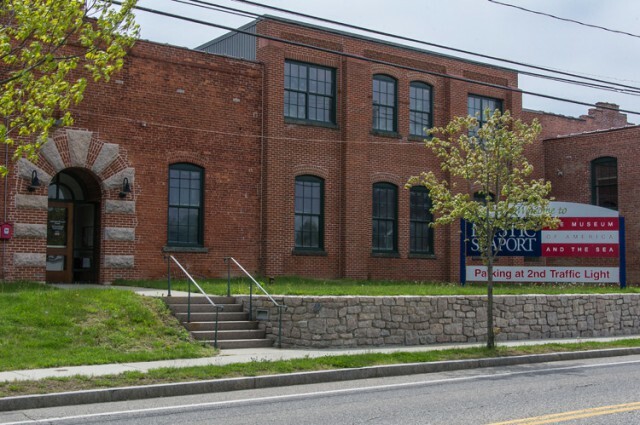 The Collections Research Center is located at 112 Greenmanville Avenue in Mystic, CT 06355. From I-95. Follow Route 27 south toward Mystic Seaport. At the traffic light in front of the Latitude 41° Restaurant, turn left into the North (Additional) Parking Lot and right into the parking area. From Route 1. Follow Route 27 north toward Mystic Seaport. At the traffic light in front of the Latitude 41° Restaurant, turn right into the North (Additional) Parking Lot and right into the parking area. Accessible and short-term parking is available on Velvet Lane just north of the CRC. An inclined ramp leads to the front door from the north side of the building. To better serve our visitors we strongly encourage you to call or email ahead of your visit.